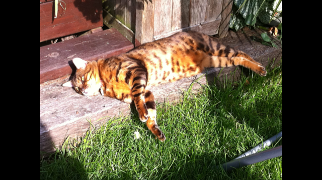 The Bengal Cat Association are happy to advertise Bengals that need assistance being re-homed. 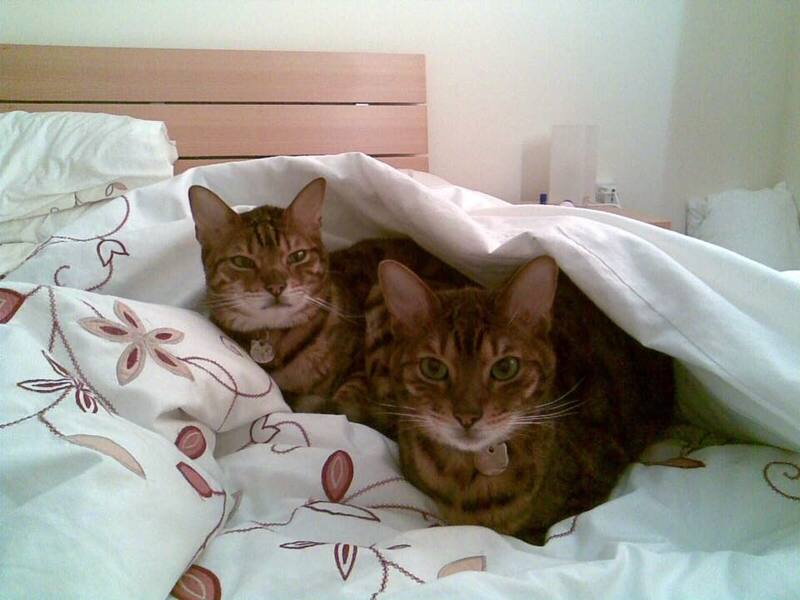 I am sadly in the situation where I have to rehome my beloved Bengal cats Cairo and Kai due to relocation abroad. They are Father and Son, and are 7 and 8 years old. They are both very good with Children and Dogs. They are very sweet. They are inside Cats. Cairo is full pedigree and from one of the best bloodlines in the world in Canada he is absolutely beautiful, and has striking Green eyes and big Rosettes They both are quite vocal and talk to you. Kai his son, also full pedigree is much bigger but still behaves like a kitten and enjoys playing and retrieving balls etc. They are both very gentle and loving cats, and I am very sad to see them go. They are fully pedigree and micro chipped / wormed and neutered. To good and loving homes only please that are experienced with Bengals and that have no other Cats. To ensure this, I am asking for a small donation, which will go to a rescue animal charity. Please get in touch if interested. Alternatively would be looking for someone to temporarily foster them for 6/7 months before they complete requirements to travel. I will pay someone to do this. Please contact coralielondon@mail.com for further details. Sassy is possibly a Bengal cross. Fully vaccinated against feline flu, enteritis and leukaemia, micro chipped, up to date with worming & flea treatment.Female (not neutered yet due to medical issues. However, she will be neutered prior to leaving for her new home). Sassy does have digestive issues which means she needs to be on a specific sensitive diet for life and may have periods of upset stomach at times of stress. She doesn’t like other animals & is not used to children – causes stress/upset stomach, but is fine with adults. 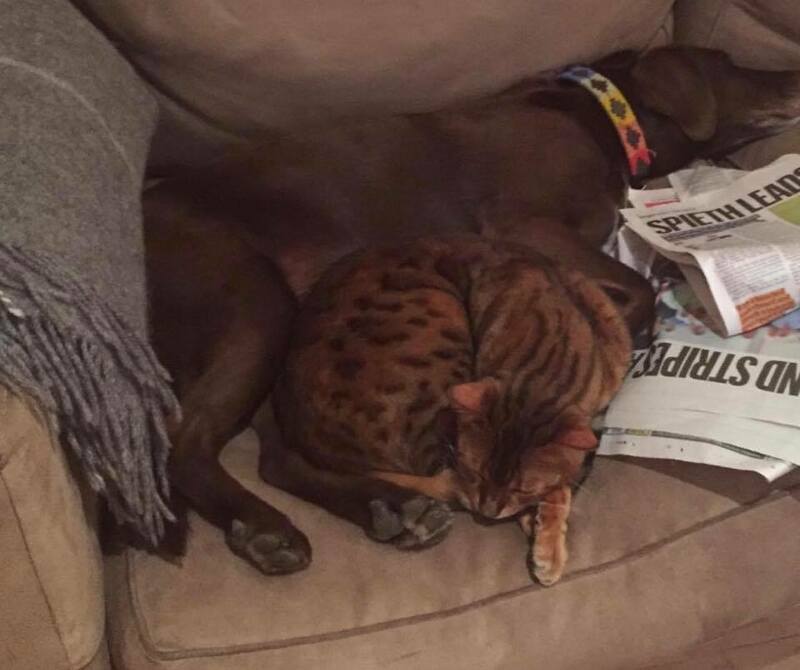 Mango is an 11-year-old brown spotted Bengal with pedigree paperwork. She is neutered, micro chipped and vaccinated. 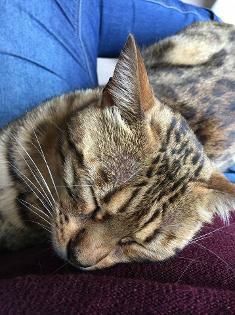 Mango has beautiful markings and a sweet nature and likes to chat and play. Mango does go outside someday but she prefers to be snuggled up in a warm spot on a bed and so would be happy being an indoor cat if necessary. Mango has lived happily with our family since she was a kitten along with our 2 othe...r cats. Unfortunately, our eldest cat recently died of old age and Mango has since started trying to win the position of top cat by fighting with the remaining cat and marking her territory. Having tried to unsuccessfully to resolve this, we are now reluctantly looking for a new home for her where she is not in competition with other pets. Mango enjoys human companionship and has an affectionate relationship with my now grown up children. 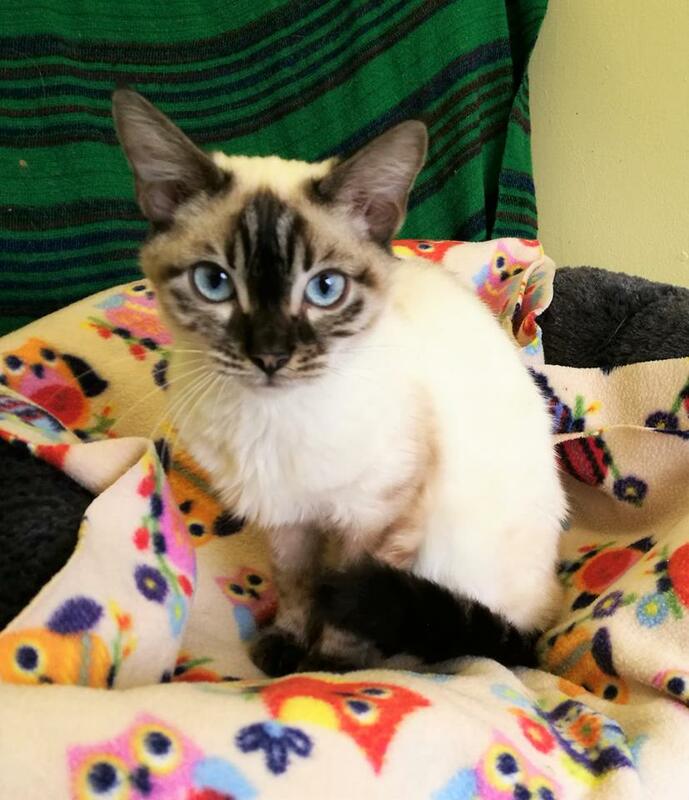 She is a little shy at first but once she gets to know you will happily spend as much time cuddled up to a human companion as they will allow. Although she has coped well with the hustle and bustle of our growing family over the years, I think she would now prefer a calm home with no other cats or dogs as she enters her later years and I believe that in this environment she will continue to be a lovely pet for someone. Muriel has found herself in a rescue centre on Sunday and isn't coping very well. She needs to be placed in a home environment ASAP. Assessment has been difficult due to Muriel being extremely stressed. 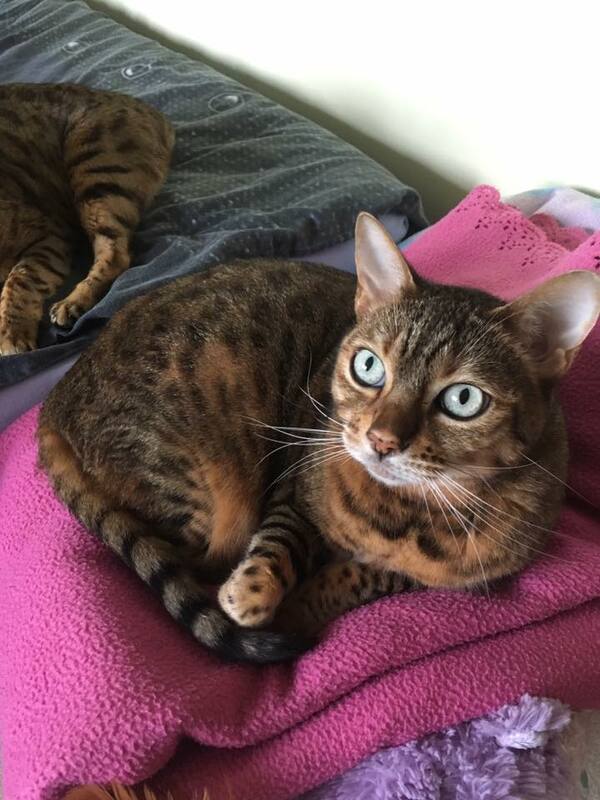 Muriel is a stunning Seal Lynx Snow Spotted Bengal. She is 6 years old and spayed. She is vaccinated and hopefully she will be chipped and be... given flea & worm treatment before leaving for her new home but this is proving difficult at the moment due to her stress levels. Muriel has shown stress related aggression whilst at the rescue centre. Also, in her previous family home she was fine with the husband and children but hated the wife, she had attacked the wife on several occasions. Muriel could be allowed to roam but she is terrified of other cats so prefers to be indoors. This fear of other cats is the main reason she is finding life at the rescue so difficult. Ideally Muriel needs be placed with an experienced cat person who has had Bengals or similar breeds in the past. Definitely not suitable for a multi cat household or a family with young children. Location - Waltham Abbey, Herts. LAKSHMI is searching for her new home. She is a 4 year old spayed female who has had a litter. She is chipped, immunised and has been given worm and flea treatment regularly. She will eat wet and dry cat food. She is an outdoor cat though a thoroughly incompetent hunter. She is very shy at first but extremely affectionate, she will greet you with chirr...ups and purrs as soon as you touch her. She likes to spend as much time as you can spare with her lying on your lap with her head on your shoulder. She needs to be the only cat in the household, and this is why her owner is very reluctantly looking for a new home for her. LAKSHMI is located in South Devon. There is an adoption fee of £50 which will be donated to a local animal rescue charity. Jake's owners have come to the difficult decision to rehome him. 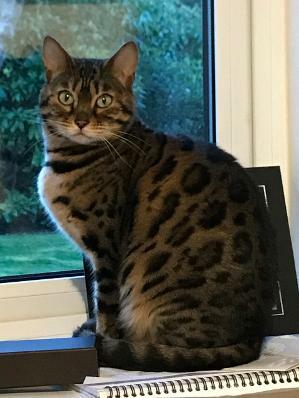 He is a 5 year old neutered brown spotty Bengal. He is chipped, wormed and fully vaccinated. 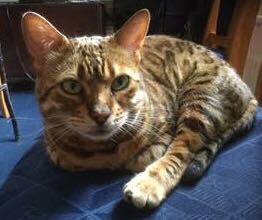 Jake had Bengal Neuropathy as a kitten but has made a full recover. Due to a change in circumstances Jake is not getting the lap time and affection he deserves. He's a really cuddly cat, loves to relax draped over your shoulder. He is also very vocal with a particularly loud shout. He eats regular food, wet and dry and loves Webbox meaty sticks. He has absolutely no interest in Dreamies. Jake would be best suited as the ONLY pet. He can be a bit needy and it would be good if he wasn't competing for attention. He's an outdoor cat, doesn't really cope well with being kept in for more than about a week. He will come with whatever food and treats we have, a bed (not that he uses it), blanket and toys, and the cat carrier if you need it. Jake needs someone who will adore him and let him sit on their knee for more than 5 minutes. Adoption fee - £50.00. Location - Merseyside. 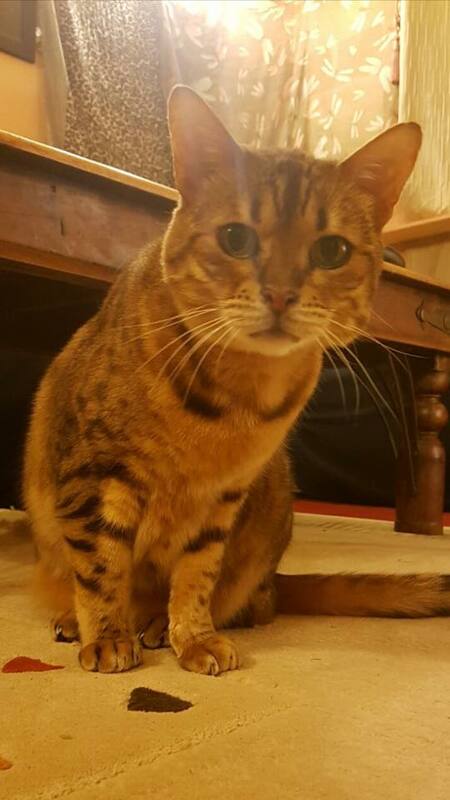 Willow is a 9 year old Bengal Cross. Her mother belonged to my uncle and was a pedigree snow Bengal who got out and about with the local lads. My uncle passed away nearly four years ago which makes this decision even harder. Willow has always been quirky, like most Bengals. Quite vocal, a bit nervous at times and she loves to play with toys especially danglers. She has been an outdoor cat most of the time but has also had times indoors which she doesn’t mind. Willow has a sensitive tummy but she can eat Hills dried Chicken food and she enjoys Webbox Liver Lick e Lix. Unfortunately over the last few years things have become challenging between Willow and I. My son left home and I then moved house. I’m the only person in the household and Willow has become fixated with me. She’ll sit and just stare at me for ages. She is very jealous of her little feline sister. Willow often blocks my way, for example at the top of the stairs or at a door, so I have to react to her. Such an attention seeker! She can get quite over stimulated if I pay her a lot of attention which has led to the odd nip from her. I find myself getting impatient with her and I hate that I feel that way. Things are not likely to get any easier as I plan to move house again soon. 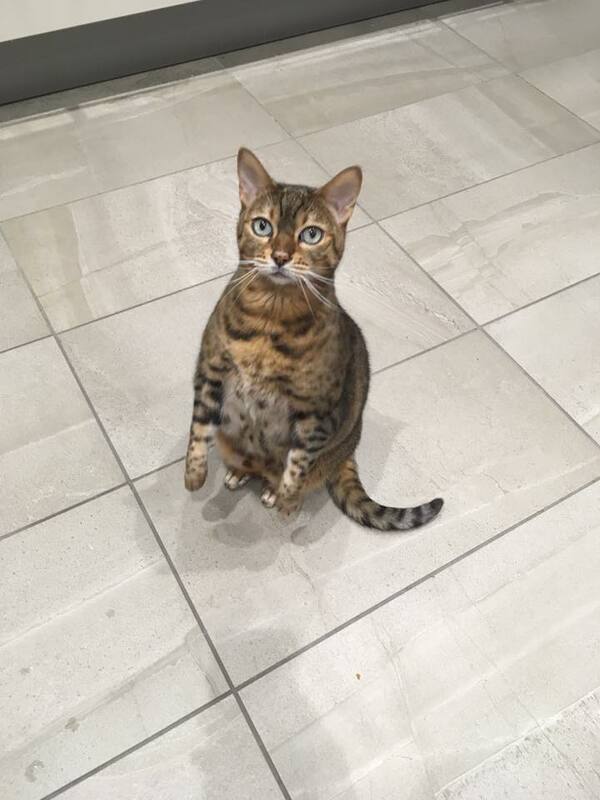 I want her and I to be happy and I think she may be happier with people who love all her Bengal weirdness. I have tried diffusers, Zylkene and behaviour modification techniques but I am ultimately looking to change who she inately is and that isn’t fair to her. I would suggest that she might be better in a busier household with more than one person so she doesn’t become obsessive again, unless that is something that is desired. Willow has lived with other cats but if she had her way she would be the only pet. Willow is neutered, chipped and vaccinated. I live near Aberdeen, Scotland. Adoption fee - £50 but Willow would come with some food, toys and bed. 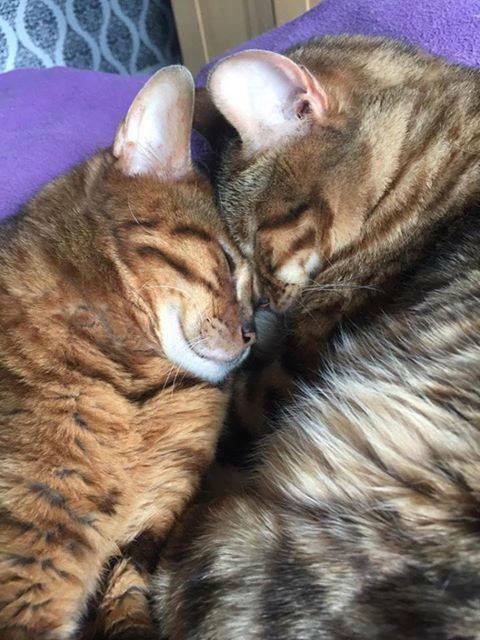 We are sadly in the situation where I have to rehome my beloved Bengal cats due to separation and relocation. They are brother and sister, from the same litter, and are 9 years old. 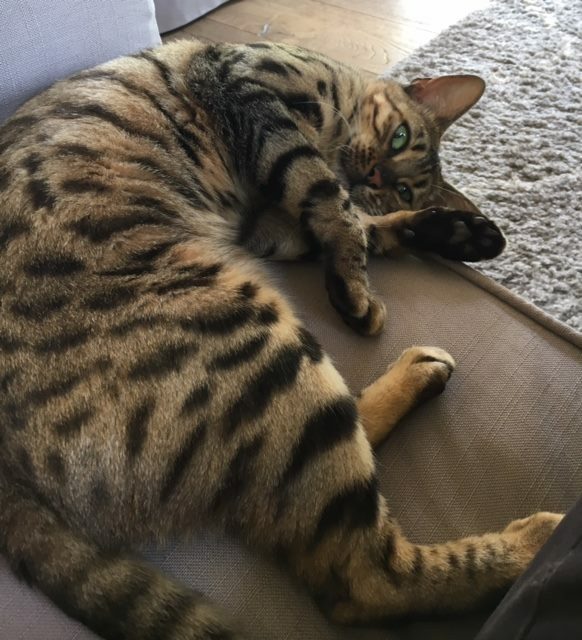 They are both very good with children and dogs, having grown up with both.Chui, the boy, is absolutely beautiful, and has the classic markings of a Bengal. He is quite vocal, but only when hungry! Nala, is smaller, with the prettiest eyes, and still behaves like a kitten as she enjoys chasing real and imaginary things! 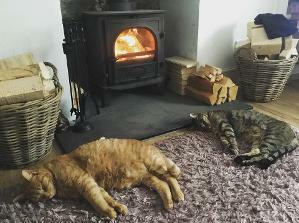 They are both very gentle and loving cats, and we are very sad to see them go. They are fully pedigree and micro chipped / wormed and neutered. Sadly their papers have been lost in the move, however, their breeder is available for a chat / email by request.To good and loving homes only please. To ensure this, we are asking for a small donation, which will go to a rescue animal charity. 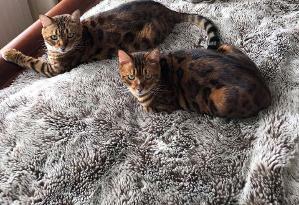 Max & Monroe, 1 Male, 1 Female, brown spotted Bengals, born 14.02.14. 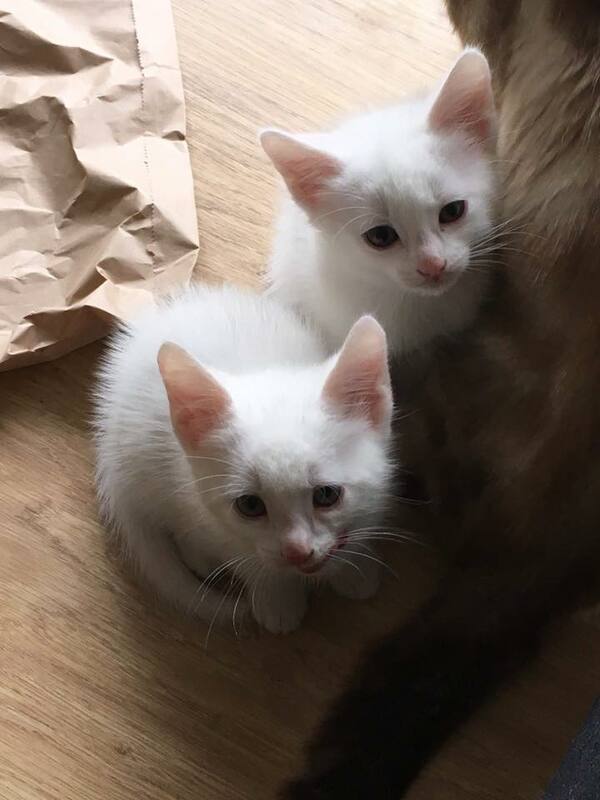 Both neutered, microchipped and up to date with their vaccinations and healthcare. Completely indoor cats, from a very loving home, totally house trained, always use a litter tray, no indoor accidents. Love to be around people, love being petted, brushed and stroked, even though they are adults, they are still playful. Never been around other animals, and have never been separated, so need to be rehomed as a pair, to, preferably, a pet free home. Have deliberated over the need to rehome, for a long while, but continued illness in the home has pushed us to have to make this decision. They are my Daughters pets, & she has cared for them, since they were 9 weeks old- so is pretty devastated at the choice we have had to come to. I am looking for a £300 rehoming fee (£150 per cat) & only want contact from serious interested parties. Previous Bengal owners would be preferable. 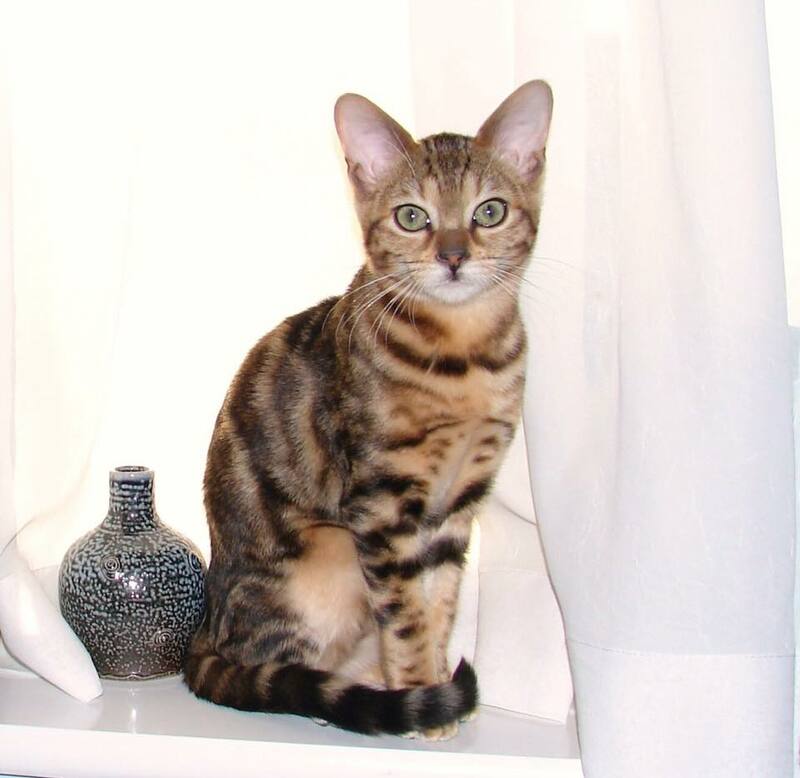 We are looking for a forever home our 11 year old Bengal cat Poppy. 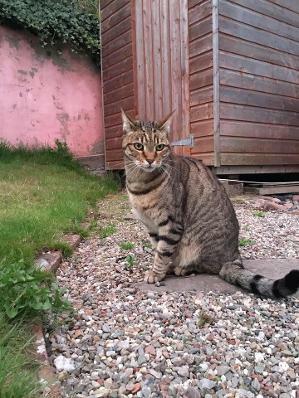 Poppy is a Neutered, microchipped female Bengal who loves to explore outside. All original pedigree paperwork held. She is very vocal and loves to talk, particularly to birds and animals seen through the windows where she chirps and squawks! Poppy is a social cat who loves being stroked and to be around people for company, although she is not a lap cat and doesn’t particularly like being picked up. She loves to sit up high on her scratch post and watch to the world go by! She gets on well with our other cat; who is a house cat so could go to a home with another cat but she would have to be the dominant animal. Poppy has never been around dogs so would prefer no dogs but is fantastic with our toddler and is fine with children/babies.She has previously been vaccinated but these have now run out. She is currently insured with Petplan on their lifetime cover policy. Poppy does use a litter tray as well as outside for toilet. Reason for re-home is that we are soon to be moving from our quiet cul-de-sac to a busy A-road with a 50mph limit. As Poppy likes to explore outside I have real concern’s that she will wander onto the road and be injured or killed. Keeping her as a house cat (which our other cat is) is not an option! It is a very reluctant decision but one I feel necessary given the location of our new house. 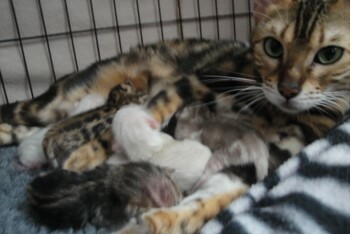 In the care of the Bengal Cat Association we now have Luna and her 5 kittens (she’s unsure who the baby daddy is). 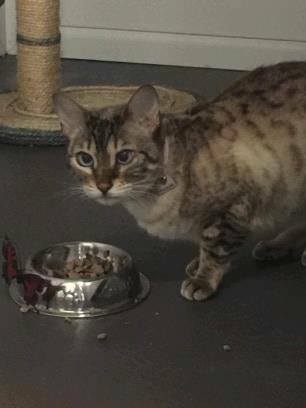 Luna is a snow marbled Bengal, she was handed into vets, having been found wandering around Lenton Abbey Industrial Estate in the Nottingham area. She was already pregnant bless her. At the time she was checked for a chip and didn’t have one. She’s approximately 2 years old. A lady at the vets took her home so that she would have a nice safe place to deliver ...her adorable litter. Sara is now leaving the country to work so we were asked to step in to help. Luna and her 5 babies are now with a Foster Mum Annette, who adores them. 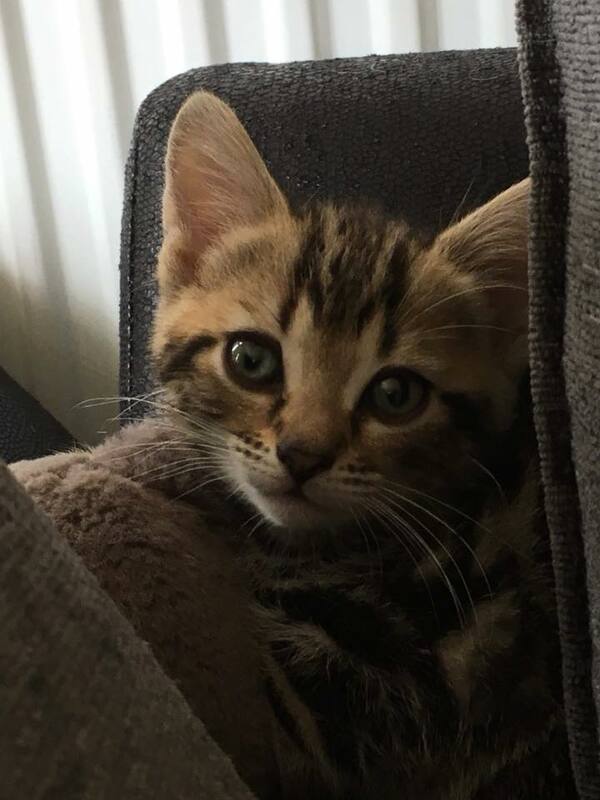 We’re happy to say that Luna will be staying with Annette forever.Kittens will be needing forever homes though when they are old enough to be homed at 13 - 14 weeks old. Luna’s a fantastic Mum and they’re all doing really well! We are currently in contact with various vets so that we can work out an adoption fee. We are not profiting from this as a Breed Club, from an ...ethical point of view the adoption fee will cover. This is Casper, he’s 4 years old. He is very affectionate but can be either jumpy or a bit too playful. Consequently he’s scratched my 5 year old and she’s now very frightened of him. He loves to explore outside but also likes to find cosy places to sleep indoors. We have a dog and they get along but mostly ignore each other. I don’t think he gets on with cats. He likes to be involved with what your doing. We would really like to find him a home where he will be able to stay happily forever, we’ll be sad to see him go. There has sadly been a change in her owners family circumstances which mean that they are no longer able to keep Silky as their family pet. 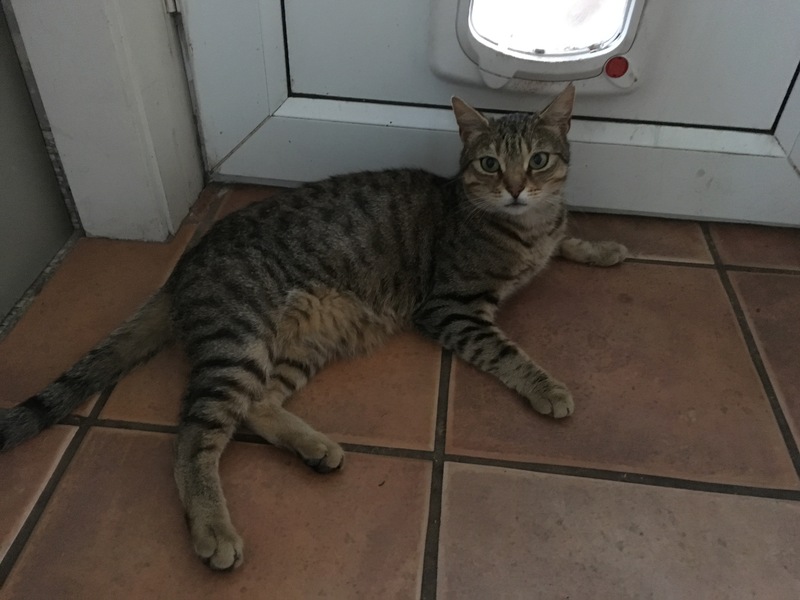 "Silky has been such a wonderful addition to our household and is very much loved by all the family, but unfortunately due to our circumstances we just wont be able to keep her anymore. Silky is approximately 4 years old, and is a retired breeding cat. Her temperament is wonderful, she is great with young children (from age 1 through to age 8!) and has been very adaptable to a busy family life. She will often seek out the family to be involved in whatever is going on, whether it’s in the garden, the lounge or snuggling up on a bed. She also is very happy snoozing in front of the fire or a spare lap." 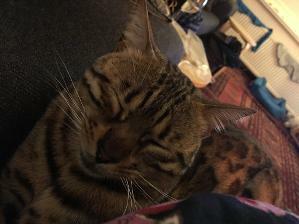 We are located just outside Southampton and are looking to rehome our beautiful 4 year old female Bengal called Nubia. We have had her since a kitten but during the last year she has started being bullied by her sister and our neighbours new cats which is making her very anxious. We feel she would be much happier in a home without other cats. She is really intelligent and curious and will fetch and bring back toys like a dog She is affectionate and chatty and loves to be petted and cuddled and to curl up on your bed at night. She is approx 4kg, spayed, microchipped and all vaccs are up to date. 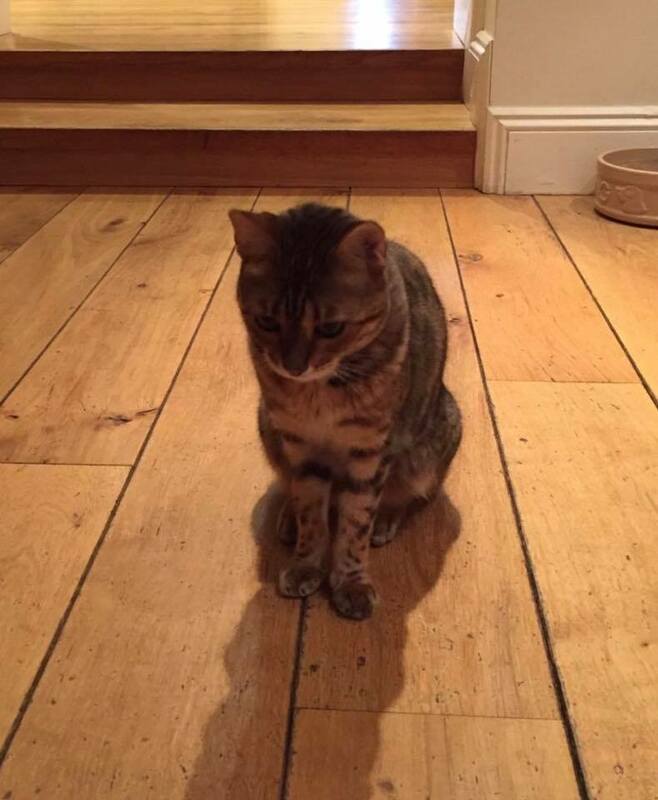 Amber is a gorgeous 5 year old spayed female Bengal who needs a new forever home. She is microchipped, has no current health issues and her vaccinations will soon be up to date. She will only drink running water and has a water fountain. She eats Royal Canin and has never touched wet food. She currently has access to outdoors but does not wander far so would preferably be able to do so in her new home. Amber loves people, she is very vocal and loves to jump into your arms. As a kitten she lived with an older cat but is currently quite fearful of other cats. Ambers issue and the reason why she is regrettably being rehomed is because of her overt jealous reaction towards a toddler member of the family. Amber would not be suitable for rehoming to a family with young children but would be fine with older children. Amber is currently located in Devon but the owner is willing to travel with Amber to her new home. Sam and Frodo are 11 year old neutered male Bengal cats who are brothers from the same litter and have always lived together. 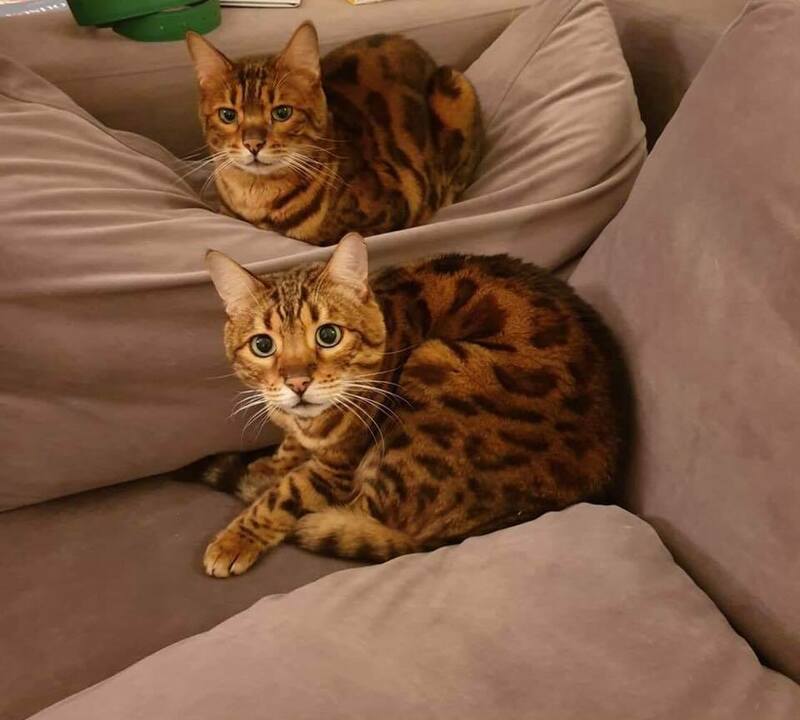 They were bred at Tobysden Bengals. Due to family bereavement, they are in need of a new home. They are a beautiful pair of cats; Sam is the more placid one and likes to be stroked often and is happy being handled whenever. When Frodo wants attention he likes lots of it and has a loud purr! They are both go outdoors although rarely venture further than a few gardens away. They sleep indoors and have been kept in at night all their lives without a problem. They have lived with a 3 year old boy since his birth and simply ignore him. They have never lived with other pets. Both have been neutered and and have had yearly vaccinations every February. They are both fit cats for their ages and neither have any long term health conditions and are on no medication. They eat a mixture of dry and wet food. The family are wanting to find their mums much loved kitty a loving safe forever home. they can't keep her as they already have cats that won't accept her. She is spayed and Micro chipped .